my last indulgence this pregnancy was to photograph this baby bump. after having been through three other pregnancies photographing this moment was never an interest until i realized i would probably never have this moment again. suddenly i can't seem to let it go. i want to photograph this bump. i want to remember every moment. i want to hang on to every movement, hiccup and cough. i always thought it was so sappy when women would talk about how wonderful pregnancy was and the miracle of a child growing inside of your womb and now i am at the point. it IS miraculous. it IS wonderful. it IS one of the most amazing things i will ever do in my life. it is something that i never want to forget. it is also something i want my children to see that i truly love to do. bringing them into the world was the biggest blessing i have been given. 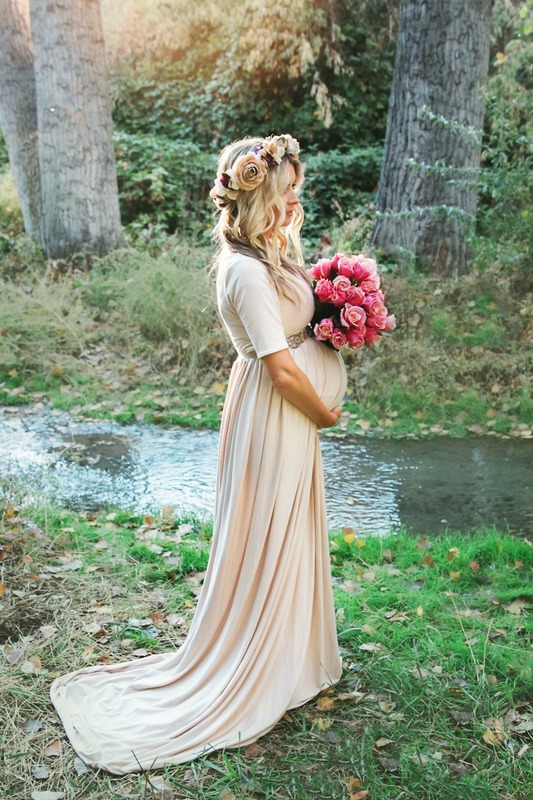 when planning this maternity shoot i found a company online that makes dresses designed specifically for maternity shoots. Sew Trendy Accessories specializes in gorgeous gowns to accentuate the beauty of your growing bump. along with that they offer beautiful floral crowns, dresses for girls and accessories for infant photoshoots. it is basically a one stop shop for all women who are expecting. i picked out this cute jersey dress and crown. i knew i wanted something neutral that would blend well with natural surroundings. i added the beaded belt for an extra bit of glam and finished off the look with some of my favorite Kendra Scott jewelry. my favorite photographer Danielle Torres Photography really captured the moment i was looking for. she has such a vision and an eye for detail that she can create beauty in the most abstract places. when we showed up here to shoot it had rained the day before and the park was flooded and marshy. somehow she still managed to make it look like the most beautiful, dreamy location and highlight the dress and the bump in their best light. my intentions for these photos are to save them for my posterity. i want my kids to see these someday and see the beauty of motherhood, the miracle of families and my love and adoration for them.